Over twenty years ago a delightful lady used to live in East Cowes and for much of her life had worked at Osborne House when it functioned as a convalescent home. Members of the East Cowes Branch of the Isle of Wight Society had intended for some time to record her memories of those days before it was too late. Spurred on by this possible loss the members held a meeting with other interested people from the community. 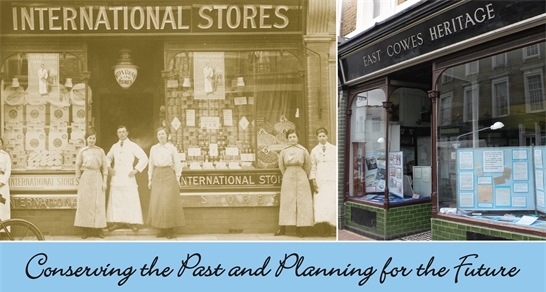 The question was asked "Is it worth while recording East Cowes history?" The unanimous answer was "Yes". Mr John Barnes, recently retired as Deputy Head of Medina High School, took on this project. All the stewards are volunteers and give at least an hour and a half a week of their time and expertise. Two stewards are needed at all times. More volunteers are welcome. The Heritage Centre started with very little archive material. The majority of information has come from local residents and the general public. Twenty years after opening we are still collecting. We are very grateful for any new material and artifacts supplied. Photos and text are normally copied and the originals returned to their owners. Contact us to email photographs.